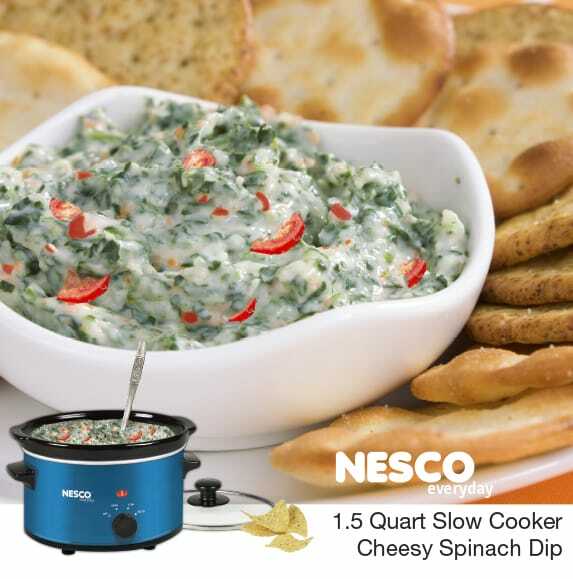 The NESCO 1.5 Quart Slow Cooker is perfect for making Cheesy Spinach Dip and keeping it warm on your party buffet table. To kick your Spinach Dip up a bit simply add the optional chopped Jalapeno peppers. crackers, cocktail rye bread or fresh cut vegetables to serve. Set NESCO Slow Cooker to HIGH. Lightly wipe cook pot with cooking oil. In mixing bowl, combine all ingredients; stir until well blended. Spoon into preheated cook pot. Cover; bake 30 to 40 minutes or until center is set and edges are puffed. When heated, set control to AUTO. Serve warm with crackers, cocktail rye bread or your choice of cut fresh vegetables. Let us know some of your favorite slow cooker dip recipes.